PHMSA's final rule on excavation enforcement establishes a process for enforcement of minimum Federal damage prevention standards in States where damage prevention law enforcement is inadequate. Excavation damage continues to be a leading cause of pipeline incidents. Pipeline incidents caused by excavation damage can result in fatalities and injuries, as well as significant costs, property damages, environmental damages, and unintentional fire or explosions. In August 2017 PHMSA submitted to Congress the report titled "A Study on Improving Damage Prevention Technology." Also see Appendix A to the Report, regarding PHMSA-Supported Research and Development Projects and its Competitive Academic Agreement Program. This study looked at improving existing damage prevention programs through technological improvements in location, mapping, excavation, and communications practices to prevent excavation damage to a pipe or its coating, including considerations of technical, operational, and economic feasibility and existing damage prevention programs. The adjudication process for administrative enforcement proceedings against excavators where Federal authority is exercised. In October 2014 PHMSA submitted to Congress a report entitled, "A Study on the Impact of Excavation Damage on Pipeline Safety”. That report was prepared in response to a requirement in the Pipeline Safety, Regulatory Certainty, and Job Creation Act of 2011 (Public Law 112–90, January 3, 2012) that directed the Secretary of Transportation to conduct a study on the impact of excavation damage on pipeline safety, including the impact of removing all exemptions for mechanized equipment from State one-call laws. PHMSA has gathered and reports excavation damage related information for each state. Go to the index of State Pages on this site to access a wealth of information for each state. Follow the state “Damage Prevention Information” links to access a variety of data and information related to damage prevention for each state. Additionally, PHMSA’s Pipeline Data Mart (PDM) allows you to query state-specific pipeline excavation damage data. PHMSA has collected pipeline incident reports since 1970. The reporting regulations and incident report formats have changed several times over the years. PHMSA has merged the various report formats to create pipeline incident trend lines going back 20 years. Follow this link. PHMSA developed and maintains a summary of state damage prevention laws. PHMSA’s summary reflects state damage prevention law requirements categorized relative to: Excavator Requirements; Operator Response; and, One Call, Enforcement, and Reporting. Most of the information from PHMSA’s State Damage Prevention Law Summary may be viewed via our online mapping application. You may view all the summary information for individual states by visiting the Damage Prevention Information pages. You may also download the entire summary spreadsheet for all states (Microsoft Excel format). The nine elements of effective damage prevention programs were cited by Congress in the Pipeline Inspection, Protection, Enforcement and Safety (PIPES) Act of 2006. Since 2009 PHMSA has lead assessments of state damage prevention programs to characterize the extent to which they incorporate the nine elements. These assessments enable PHMSA, working with state pipeline safety program managers and one-call centers, to gain a better understanding of the successes and challenges existing in state damage prevention programs, where additional improvement is needed, and where PHMSA should focus its assistance. PHMSA conducted state damage prevention program characterization (SDPPC) assessments in 2009, 2011, and again in 2014. The updated characterizations have shown that States have taken steps to strengthen their programs, but there remain areas where state programs could still be improved relative to the nine elements. See more discussion of the SDPPC initiative. Drawing on the definition of effective damage prevention programs found in the PIPES Act of 2006, PHMSA developed guidance to assist stakeholders by examining the nine elements specified in the PIPES Act and offering suggestions for implementing them at the state level. The guidance, “Strengthening State Damage Prevention Programs”, can support States to improve their programs by incorporating the nine elements and by identifying and implementing positive changes in processes, procedures, technologies and damage prevention laws. PHMSA provides grant opportunities intended to help improve state damage prevention programs. It is important that everyone Dig Safely by always following safe digging practices. The primary tool for avoiding damages to underground facilities is timely communication between excavators and the owners of the facilities. It is important to Call Before You Dig and Dig Safely. One-call centers facilitate this communication process by enabling an excavator to place just one call, prior to digging, to request that all underground facilities in the area of a planned excavation be located and marked. Call 811, toll free, to reach the one-call center that will notify the companies that may operate underground utilities in the area you plan to dig. Those companies can then determine and mark the exact location of their utilities so that you can avoid hitting those utilities when you excavate. You may also dial 1-888-258-0808. Visit Call811.com for more information. Hitting underground utilities when you are digging can cause injuries, even deaths, environmental damage and loss of critical infrastructure and services. If you don’t make the call, you could be liable for damage costs and repairs, as well as subject to potential penalties. It is important to call the one-call center before you dig – anytime of the year and no matter who you are or how big or small your project is. 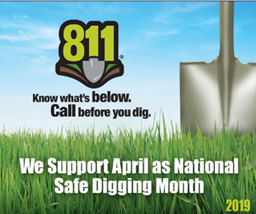 The call is free so Call 811 Before You Dig. The CGA is a member-driven nonprofit organization committed to saving lives and preventing damage to underground infrastructure by promoting effective damage prevention practices. In 1999, PHMSA published the Common Ground Study of One-Call Systems and Damage Prevention Best Practices. 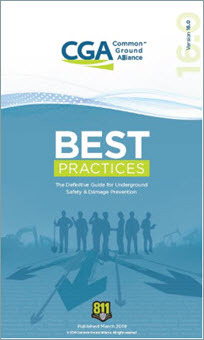 The Study identified and validated existing Best Practices to prevent damages to underground facilities. The Best Practices were intended to be shared among stakeholders involved with and dependent upon the safe and reliable operation, maintenance, construction, and protection of underground facilities. Stakeholders are encouraged to examine and evaluate the Best Practices for possible incorporation into state, local, and private stakeholder underground facility damage prevention programs. In 2000, the Common Ground Alliance (CGA) was formed to further the work completed during the Common Ground Study. Since the CGA’s establishment, the Best Practices have been regarded and utilized as an important resource for underground damage prevention. The Best Practices are designed to improve worker safety, protect vital underground infrastructure, and ensure public safety during excavation activities conducted near existing underground facilities. Now widely recognized as the “Best Practices”, they are continuously reviewed by a CGA committee, and changes to existing Best Practices and new Best Practices are agreed on by consensus. The CGA releases a new edition of the Best Practices every spring with updates that reflect changes in damage prevention, including those caused by the always-evolving technologies that are at the core of progress in the industry. The CGA’s Data Reporting & Evaluation program collects and analyzes critical information regarding damage prevention and produces targeted recommendations to stakeholders about how to best protect buried facilities. To facilitate damage information data collection, the CGA launched the Damage Information Reporting Tool (DIRT) to enable stakeholders to submit underground damage and near-miss data reports through a completely secure, private web application. 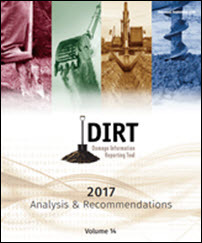 Using this information, the CGA publishes an annual report (the DIRT Report) that includes data analysis, conclusions, and recommendations to identify areas where damage prevention programs are most effective and where enhancements are needed. Serving as a resource for damage and one call center data collection, analysis, and dissemination. We partnered with damage prevention stakeholders in Virginia to use existing GPS technology to enhance the quality of communication among excavators and owners of underground facilities. The Phase I Report includes guidance on how other States could incorporate GPS technology in their One-Call Center communications. Federal pipeline safety regulations require pipeline operators to conduct continuing public awareness programs to provide pipeline safety information to stakeholders. This work consolidates a collective knowledge on the many aspects of mechanical damage to pipelines. The report has three main parts addressing damage prevention, detection and characterization from primarily an onshore, transmission pipeline perspective. However, the prevention portion of this report is significant for gas distribution systems. Pipeline Mechanical Damage. [This is a large file (approx. 40 MB)]. The importance of damage prevention is recognized within our R&D program by establishing a distinct category for projects geared toward damage prevention. Damage Prevention R&D Projects are designed to provide stakeholders with improved tools to reduce the risk of excavation damage. We have consistently taken a non-regulatory approach to pipeline damage prevention. However, we have used Advisory Bulletins to emphasize important actions pipeline operators can take to protect their pipelines. In May 2002, we urged pipeline operators to follow the CGA Best Practices for damage prevention. In January 2006, we described preventable accidents caused by construction-related damage and called on operators to ensure they use qualified personnel to perform critical damage prevention tasks. 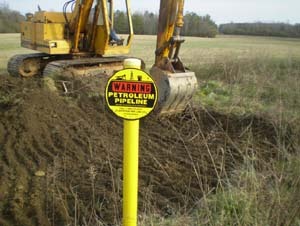 In November 2006, we emphasized the importance of following damage prevention best practices, especially for marking the location of underground pipelines prior to excavation.